If you’re searching for a midsize SUV that sticks out of the crowd and can handle all of your daily needs, then stop by Butler Hyundai in Medford, OR and check out the 2015 Hyundai Santa Fe. The new Santa Fe offers you with the same usability of a conventional SUV, but is in a more stylish, compact body. Butler Hyundai is one of Oregon’s top-ranked Hyundai dealerships and proudly serves the Medford Metro Area, Grants Pass, and Klamath Falls, OR. Visit Butler Hyundai for a first-class experience and put the new Santa Fe to the test. There’s a lot of opposition in the midsize SUV market, so let’s see how the 2015 Hyundai Santa Fe performs against the Ford Escape. Midsize SUVs have powerful engines that allow them to tackle a variety of tough jobs. However, the Santa Fe’s base engine is more powerful than any of the Escape’s offerings. The Escape has three engines for you to choose from. The base engine is a 2.5L inline-four that makes 168 hp. The next step up is a 1.6L EcoBoost engine producing 178 hp. The range-topping Escape features a 2.0L EcoBoost engine generating 240 hp. The entire Santa Fe lineup features a 3.3L V6 making 290 hp. Those who tow large cargo on a regular basis will also be pleased with the Santa Fe’s towing capacity of 5,000 lbs., which is 1,500 lbs. more than the Escape’s. While midsize SUVs offer you with the same versatility as a conventional SUV, they don’t offer you with the same interior space. However, the new Santa Fe provides you with a spacious interior that makes using the vehicle everyday easier. The Escape possesses a passenger volume of 98.1 cu. ft., while the Santa Fe offers you with 146.6 cu. ft. of passenger volume. The extra 48.5 cu. ft. of interior space allows the Santa Fe to have more rear hip room, front hip room, rear headroom, rear legroom front shoulder room and rear shoulder room than the Escape. The Santa Fe can also seat seven passengers in comfort, while the Escape can only seat five passengers. When using a midsize SUV on a daily basis, cargo capacity is at the top of the priority list. With its ability to seat seven passengers in comfort, the Santa Fe can also hold all of your cargo with ease. 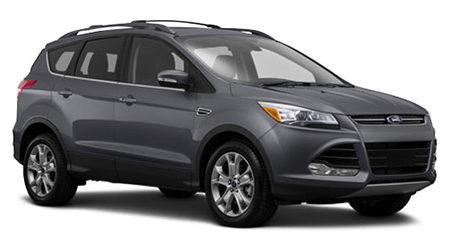 The Escape has a maximum cargo capacity of 67.8 cu. ft. and 34.3 cu. ft. of cargo space behind the second row. The Santa Fe has a maximum cargo capacity of 80.0 cu. ft., 40.9 cu. ft. of cargo space behind the second row and 13.5 cu. ft. of cargo space with all of the seats in place. The 2015 Hyundai Santa Fe is a midsize SUV that excels at being used every day. 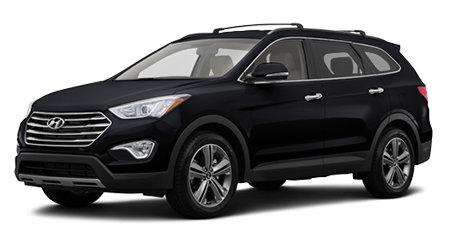 When comparing the Santa Fe to the Ford Escape, the Hyundai has the edge with its powerful engine, superb cargo capacity and spacious interior. Come by Butler Hyundai in Medford, OR and test drive the new Santa Fe today.